Original 1990 Manitoba government commitments to complete protected areas networks that represent landscapes in Manitoba's natural regions, have been reconfirmed by Manitoba's current government. Each government Action Plan for a Network of Protected Areas, since 1993, contains specific goals and timelines for establishment of new protected areas. Many of these goals are not yet met. Currently Manitoba is also without an Action Plan. Manitoba's 1998 Memorandum of Understanding for First Nation Protected Areas was extended and confirmed by the current Manitoba government. Most new protected areas in Manitoba since 1998 were established based on the requirements of the First Nations MOU. Actions to establish new protected areas in Manitoba increased in 2009 and 2010. For the 2011 Manitoba election Manitoba Wildlands again issued election surveys, including for protected areas, parks, and world heritage site. In advance of Manitoba Wildlands' annual Protected Areas Grade and Audit - to be released fall 2007 - Manitoba Wildlands Director Gaile Whelan Enns has written a Status Report article for Manitoba Eco-Network's September/October 2007 issue of the EcoJournal. In the 1990s, Manitoba led the way in Canada for its action to protect the largest proportion of its lands from development - 5.5 million ha protected by 2000. Today, according to Manitoba Wildlands' article in EcoJournal, the establishment of protected areas has slowed and protection standards - embedded in Manitoba public policy since 1990 through legislation, regulation, and national reporting - appear to be at risk. Manitoba Wildlands also aims to analyze and comment on the validity, status and progress regarding these environmental commitments, declarations and policies from the Manitoba government Throne and Budget speeches and associated documentation. We will post analysis for the five categories (see above) as they are completed. The Manitoba government included a significant protected areas establishment commitment in the 2006 Throne Speech. Finance Minister Selinger indicated that Manitoba would establish at least one significant new protected area a year. Significant implies protected areas of significant size and ecological value. 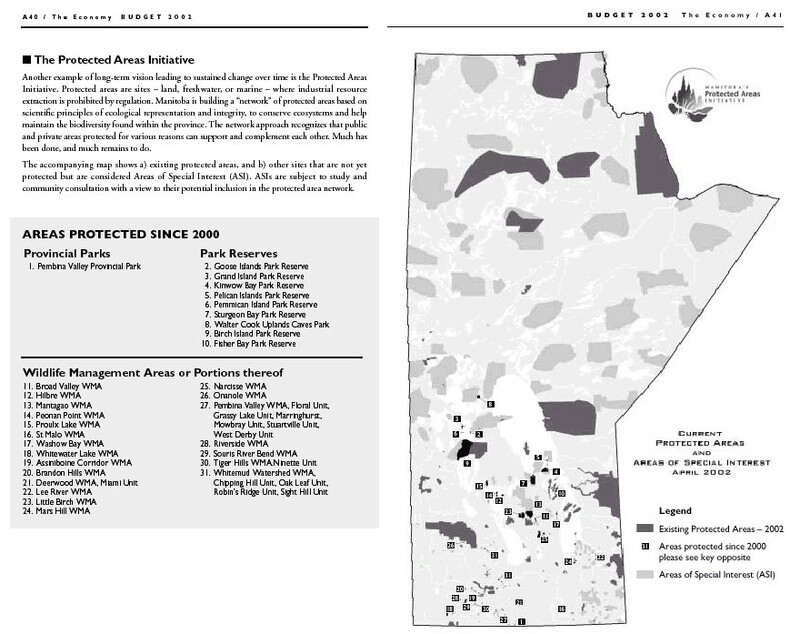 As of June 1, 2007 no new significant protected areas have been established. Protected lands requests from First Nations involved in the World Heritage Site are outstanding, and over 100 candidates designed by Manitoba Conservation, many within boreal forest regions, are still unprotected. 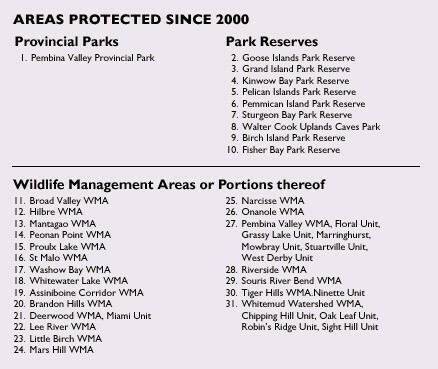 Manitoba Wildlands provincial and federal election surveys in 1999, 2003, 2004, 2006, and 2007 contain protected areas content, and other categories. Protected areas commitments in 1999 are posted in letter form. The Manitoba government publicly stated it support in early December 2004 for the Atikaki/Woodland Caribou/First Nations World Heritage Site World Heritage Site (WHS) nomination which includes both Ontario and Manitoba lands, on the east side of Lake Winnipeg. This support has been reiterated by the Conservation Minister and Premier over time. During the 2007 Manitoba election further commitments regarding the WHS nomination. Manitoba's NDP government renewed and extended the Action Plan for a Network of Protected Areas in 2000. The Action Plan was based on the same goals and ecological methods, and same natural regions system used since 1993. 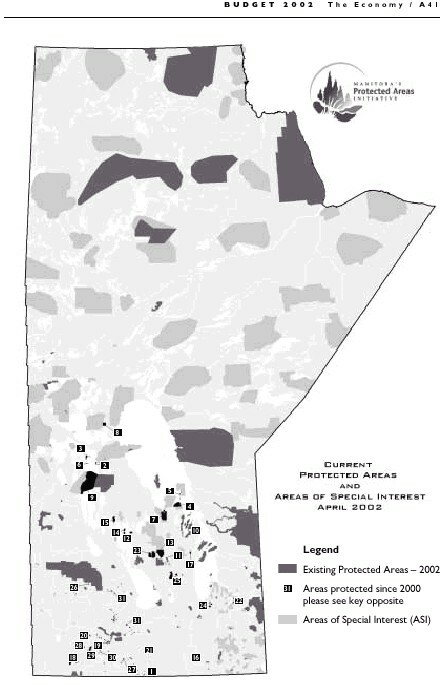 The protected areas networks in Manitoba, especially in the forest regions remain incomplete. Over 100 Areas of Special Interest designed by Manitoba Conservation continue to be available for protected status. Many of these have been approved by Manitoba's mining sector, with many also nominated by First Nation communities. The definition and ecological assessment of a protected area in Manitoba continue to be in place and reflected in public policy. 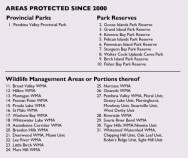 As of November 2009 Manitoba has not updated or replaced its Action Plan for a Network of Protected Areas. Manitoba Wildlands issues an annual technical assessment and grade regarding the Manitoba's government's actions to establish new protected areas. Manitoba Wildlands also issues an annual protected areas audit that contains the regulatory and technical information for protected areas in the province. A System Plan for Manitoba's Provincial Parks was created in 1998 under the authority of the Provincial Parks Act by Manitoba Conservation. The system plan establishes the boundaries, classifications and land use categories of every provincial park and park reserve in Manitoba. It also identifies provincial park and park reserve lands that contribute to Manitoba's network of protected areas. During 2002, the provincial government renewed their protected areas commitments. See Next Steps: Priorities for Sustaining Manitoba's Forests, page 5. 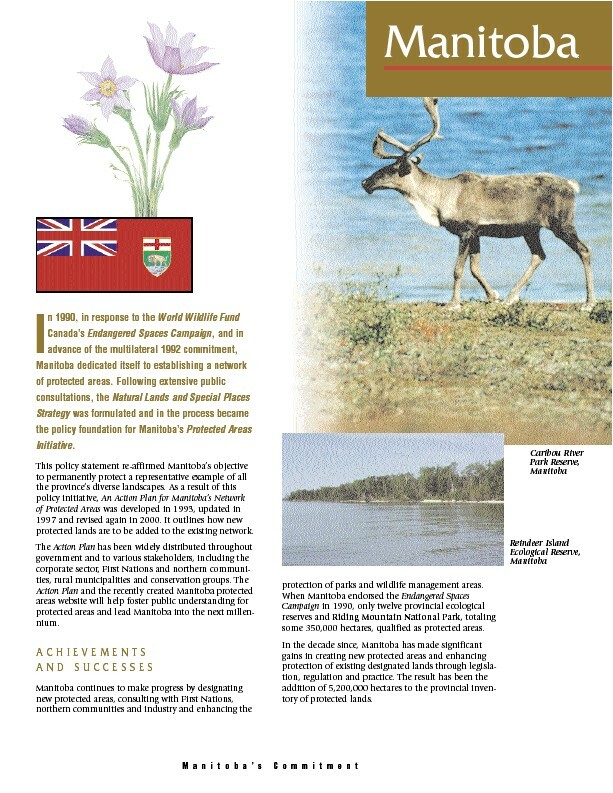 The policy document is posted by the Manitoba government, and referenced by the Conservation Minister in speeches over time. 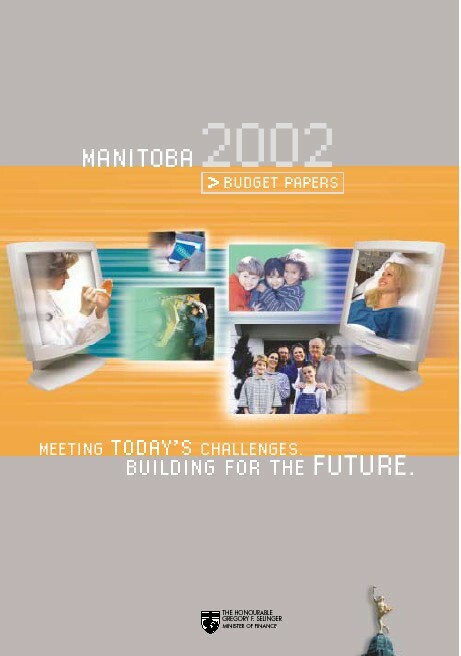 On April 26, 2002 the Manitoba Minister of Finance released Manitoba Budget Papers which contain a map of areas under review for protected status, protected sites since 2000, and a renewed statement of intent. Click here for a combined version of the Map and List of Protected Areas with text. 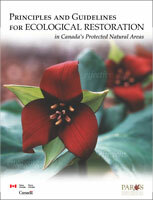 Parks Canada published Principles and Guidelines for Ecological Restoration in Canada's Protected Natural Areas, 2008. These guidelines were produced so Canada's federal, provincial and territorial parks and protected areas agencies can deal with threats to these ecologically significant areas such as "incompatible land uses, habitat fragmentation, invasive species, air and water pollution and climate change impacts". They also want to ensure that stakeholders, policy makers and the people who visit these areas are engaged in the process. The focus of the Principles and Guidelines for Ecological Restoration in Canada's Protected Natural Areas is to restore natural heritage, native biodiversity and ecosystem function while keeping the human-environment connection. The goal of Ecological restoration is to "initiate, re-initiate or accelerate processes that will lead to the evolution of an ecosystem that is characteristic to a protected area's natural region". Parks Canada feels it is imperative that throughout this process agencies understand that humans must be part of the restoration process. Also, restoration must occur if future generations are to experience and appreciate these protected areas enough to continue the long term restoration. The Principles and Guidelines also make sure that Aboriginal peoples are consulted as part of the process, and that their practices are incorporated into the planning and management of these protected areas. The Principles and Guidelines were an initiative under the 2006 Parks Canada Strategic Direction and have the endorsement of the Parks Minister. 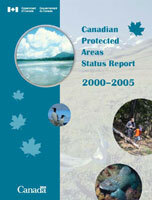 The Canadian Protected Areas Status Report 2000 - 2005 (released 2007) describes the current state (as of end of 2005) of terrestrial and marine protected areas across Canada. Governments and protected areas agencies conducted a "self assessment" regarding the status of protected areas design, planning, management and establishment across the country. Specifically, Canadian government considers protected areas to be those classified as Category I - IV by the IUCN, where industrial activities such as mining, forestry, and hydro development are regarded as being incompatible with management objectives. For Manitoba, which has not updated its Action Plan for a Network of Protected Areas since it lapsed at the end of 2003, this report reaffirms the definition of a protected area and reiterates standards for activities permitted and prohibited within protected areas. The report text provided by Manitoba also acknowledges that pre-existing public policy regarding protected areas establishment continues to be in place in Manitoba. The directors of Parks for each provincial or territorial jurisdiction in Canada, and Parks Canada make up the Canadian Parks Coucil, formerly known as Federal Provincial Park Council. They undertake joint research, exchange management or parks establishment information, and publish joint material. 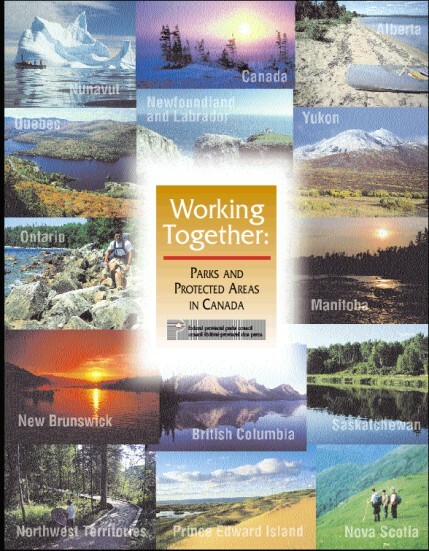 The Manitoba section in Working Together: Parks and Protected Areas in Canada is provided below. It contains a summary of protected areas actions during the 1990s, and intended activity to complete Manitoba's network of protected areas. Contents were provided by Manitoba Conservation. There are over sixty First Nation communities in Manitoba. They are organized in three Assemblies, and several tribal councils. First Nation communities in Manitoba are covered by treaties #1 to #5. Manitoba also has many Métis communities. Often these are located near a treaty community. In northern Manitoba many First Nation and Métis communities are accessible only by plane for the majority of the year, with winter roads (over the ice and snow) for 2 or 3 months each winter. Decisions regarding public lands and waters affect First Nation and Métis communities. Therefore, the obligation for meaningful consultations with First Nation and Métis communities in relation to treaty and constitutional rights is an essential part of decision making about Manitoba's lands and waters. A memorandum of understanding regarding identification, establishment and management of protected areas in Manitoba by First Nation communities was signed in 1998. Manitoba Conservation is responsible for responding to First Nations communities regarding parks and protected areas. First Nations MOU. Manitoba's Conservation Minister has confirmed the principles and intent of the MOU, and the MOU is written into the terms of reference for the East Side Planning Initiative.